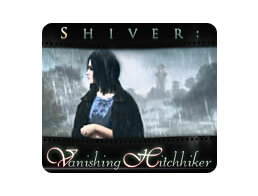 Shiver: Vanishing Hitchhiker Game - Download and Play Free Version! Have you ever heard the urban legend of the "vanishing hitchhiker"? The young woman you drop off in a sleepy little town apparently vanishes, leaving you only with a forgotten teddy bear in the back seat. This reminds you of someone you once knew, so you immediately turn around and begin looking for the woman to give her bear back. You find that the sleepy little town is actually completely abandoned but filled with creepy little items like childlike drawings depicting gruesome deaths and torn-out journal entries about strange paranormal events around town. As you travel through the town and delve deeper into its mysteries, you come to believe that you may not be alone. Shiver: Vanishing Hitchhiker offers a gaming experience that many will find both familiar and quite satisfying. 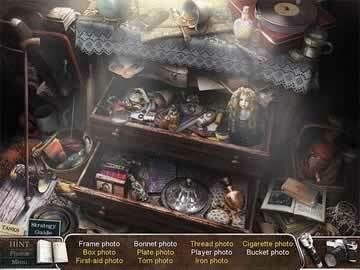 A cross between the creepy atmospheric graphics of horror games like Silent Hill and the gameplay of point-and-click adventures, it also utilizes hidden object mechanics to provide an extra level of interest. While the game doesn't necessarily do anything new, some might argue that the combination in and of itself feels new enough. As for the sound and music, they do a huge part toward the creation of the game's eerie atmosphere. Ambient sounds give you the sense of constantly being watched, and subtle effects crescendo to jump-out-of-your-seat climaxes. If you've played many horror games, you will appreciate that Shiver presents these areas well. Although Shiver doesn't attempt to be anything different. It is just a fun, scary little game to play on a rainy afternoon or a dark night. 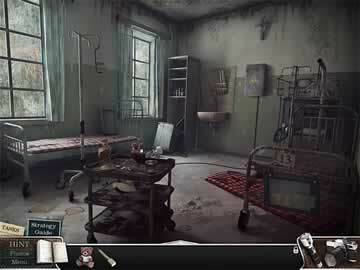 If you get stuck on one of the inventory puzzles or hidden object scenes, you may be able skip it thanks to a unique "skip bar" feature. You can use the skip bar to get past a particularly frustrating puzzle, but once you do so, you have to wait for quite some time before you can use it again. This is a good solution to the human propensity to want to take the easy way out, while simultaneously keeping the game fun. You can give each puzzle the old college try, then if you don't solve it, you can find the solution and keep moving forward in the narrative. With two styles of play, casual and advanced, you can choose how difficult you want the puzzles to be. If you enjoy horror/mystery games and like to jump out of your seat, Shiver: Vanishing Hitchhiker may be the game for you!